The Fall Season comes complete with an array of fun things to do, one of the most popular being Hay Rides. Many families count hayrides as an annual tradition that they enjoy with the little ones. There are a number of great locations throughout the country that offer beautiful scenic rides through some of the greatest farmland and cornfields. With more than 40 fall and haunted attractions, there’s a ton of fun to be had at Cornbelly’s! Enjoy the 12-acre Corn Maze, Grain Train Maze, Kiddie Maze and the Haunted Insanity Point Maze for those who are brave enough! There’s also the Pumpkin Princess Playland, Pedal Karts, Pig and Duck Races, Chicken Show, Kiddie Corral, Cow Train, Jumbo Jumper, Hayrides and more! Situated on a farm that features 90 acres, A-mazing Acres is jam packed with seasonal fun and family entertainment. Explore the 20-acre corn maze that offers over 3.5 miles of paths, take a ride on the hayride that goes around the farm, check out the horses and pick your perfect pumpkin in the pumpkin patch! The award-winning Treinen Farm Corn Maze in Lodi, Wisconsin has a ton of fun throughout the Fall Season. Along with their 15-acre corn maze that features six miles of turns, Treinen Farm also offers pumpkin picking, bonfires, horses, hayrides, a Zompocalypse, delicious food and more! Craven Farm has been in operation for over 30 years and offers a ton of seasonal fun during the Fall Season. There’s a 15-acre Corn Maze, a Kids Adventure Maze, 20-acre Pumpkin Patch, Human Foosball, Duck Races, Hay Ride to Minionville, Apple Slinger, Face Painting, Farm Animals, Storybook Pumpkin Scenes, Scarecrow Making and more! Featuring over 50 daytime attractions, Connors Farm offers a 7-acre corn maze, apple picking, barnyard animals, barnyard twister, campfires, corn hole, a corn tunnel, cow milking, a cow train, pumpkin blaster, paintball gallery, duck races, face painting, hayrides, horse swings and much, much more! Take on the elaborate corn maze at Amazing Grace, and enjoy a fun-filled day of seasonal entertainment, including a jump pad, corn hole, a cow train, duck races, pumpkin picking, a corn crib, barnyard ball zone and hayrides! This 8th Generation family farm has been providing farm fresh sausage and pork products since 1807 and offers a whole lot of seasonal fun for the family to enjoy. Along with their hay rides, visitors can also enjoy pumpkin picking, a corn maze, fire pits, a strawberry patch, flash light maze and hay tower! At Liberty Mills Farm, families can choose to complete one or all four maze trails, with just one ticket! 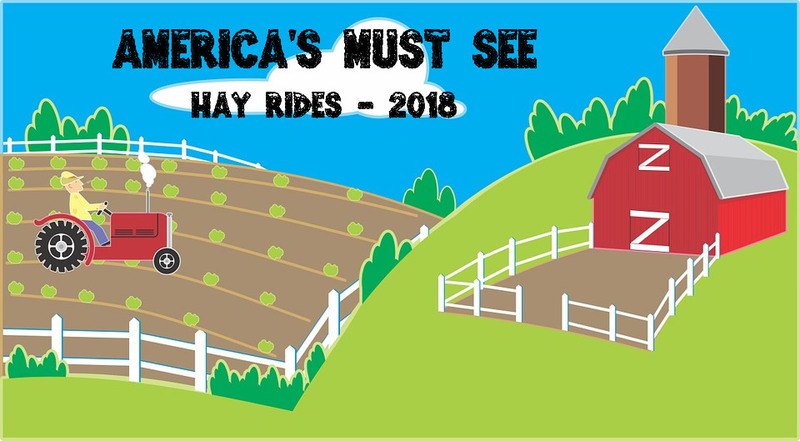 Take a ride on their hayrides that offer spectacular views and enjoy a maze that offers 25 acres of corn, filled with twists and turns that are designed to make sure you get lost! There’s a ton of Fall and Halloween fun offered at Devine’s, including the Field of Horror during Halloween time and a Corn Maze, Pumpkin Patch, Hayrides, Duck Races, Corn Hopper and Tube Swings for the families to enjoy together. There’s even Zip Line Racers and Cornstalk Wars Paintball! At Dixon’s Cool Patch Pumpkins, visitors can find the perfect pumpkins in their 40-acre Pumpkin Patch, wander through the World Record Corn Maze, enjoy Hay Rides, the Fun Zone, Pedal Cars, delicious seasonal food and beverages and more! Take on a number of farm attractions at Coolspring, including a Corn Maze, Hay Ride, Pedal Tractor Racetrack, 40′ Mountain Slides, The Barnyard Board Game, an Indoor Jumping Pad, Cow Train, Gemstone Mining, Pumpkin Blasters, Horse and Pony Rides, a Mechanical Bull, plus delicious seasonal treats and beverages, along with a ton of other great activities for the family to enjoy. With 12 acres of cornfield, Summers Farm offers an array of seasonal entertainment that is sure to keep your entire family busy well until Winter arrives. Along with their enormous corn maze, families can enjoy pumpkin picking, campfires, a pumpkin cannon, pig races and hay rides, among other fun activities! The Farmstead Corn Maze is Idaho’s original corn maze and stretches over 18 acres of land. A new design is created each year for families to wander and find their way out. Along with the corn maze, Farmstead also offers a pumpkin patch, hay rides, potato sack slide, small zip line and a ton of other great family-friendly activities. Celebrating 20+ years, Sever’s Corn Maze offers a variety of fun Fall activities for the entire family to enjoy. Along with their Corn Maze and Maze Challenge, there’s also pumpkin picking, pig races, a corn pit, exotic petting zoo, jumping pillows, wildlife shows, pony rides, a giant slide, pumpkin blasters, hay rides, zip lines and much, much more! Offering over 10 acres of family fun, Happy Day Farm has a whole lot of entertainment to keep both the adults and kids busy during the Fall Season. Venture through their 13 acres corn maze, check out the sunflower maze, hay rides, 6 piece wooden train, corn hole, pig races, pedal carts, tire mountain, horse shaped swings and a kids corner for the little ones ages 2-6! This Children’s Discovery Farm offers a Mega Corn Maze, animal interactions with over 100 breeds, an animal showcase, play & spray, Adventureland, imagine-acres, pumpkin picking, apple picking, pony rides, hay rides, delicious seasonal food and beverages and more! The Old West Pumpkin Fest at Rockin’ R Ranch features fall fun for everyone. Enjoy unlimited hayrides, pony rides, a live costume character show, pumpkin picking, gem mining, face painting, 3D house, straw mountain, a large pumpkin slow and much, much more! There’s a ton of seasonal fun to be had at Yahoo Farm, which features a Pumpkin Hunt on Sundays during the Fall Season, a Pumpkin Wagon Ride through the fields, animals, a butterfly and flower garden, corn cannon, cosmic corn maze, and a Haunted Hayride for those brave enough! Create memories that will last a lifetime while visiting Roba Family Farms! Featuring a pumpkin patch with tons of varieties, hayrides, train rides, farm animals and a 5-acre cornfield maze, among tons of other fun activities! Pumpkinland takes over Linvilla Orchards during the Fall Season, giving visitors a variety of pumpkins to choose from. There’s also daytime Harvest Hayrides that take you on a 15-20 minute ride through the scenic fields and orchards. Take a journey through Jumbo’s Pumpkin Patch to find the ideal pumpkins for you and your family. Along with tons of pumpkins, Jumbo’s also features a corn maze, hayrides, pony rides, face painting, seasonal food and more. There’s something for those of any age to enjoy during the Fall Season! The Great Pumpkin Farm offers an array of Fall activities for families to enjoy, including their enormous pumpkin patch, hayrides, hay mazes, petting zoo, playground, pumpkin parade, boo barn, pumpkin cannon, corn maze, magic shows, jumping pillows, amusement rides and games, and so much more! Pick the perfect pumpkins in the Fort Myers Pumpkin Patch, take a ride on the Halloween Express Train and enjoy a hayride with some great views. There’s also haunted carriages, music and other family-friendly attractions! Smolak Farms offers a ton of great events throughout the year, and during the Fall time there’s a bunch of activities for those of all ages to enjoy. There’s a pumpkin patch, corn maze, hop-on hayrides, delicious seasonal treats and cider and there’s a Children’s Festival Area for the little ones to enjoy a mini hay bale maze, face painting and wagon rides. Over 25,000 people visit Pumpkintown USA during its Fall Season! There’s the Pumpkintown Village where you can visit over 70 Pumpkinhead people. Then there’s the pumpkin patch, hay wagon ride, face painting, moon-bounce pumpkin and more!